Newborn skin peeling is perfectly normal. Your baby just spent a significant amount of time surrounded by a liquid environment with a protective coating on her skin called vernix, and once she’s born she’s suddenly exposed to dry air, which can affect her skin. Newborn dry skin may surprise you, but it’s nothing to worry about. Why do some newborns experience skin peeling, while others don’t? This is one instance where being premature is an advantage. Inside the womb, your baby was protected from the surrounding amniotic fluid by a natural coating called vernix. Vernix is thicker prior to week 40. Babies with a thicker layer of vernix available for protection are less likely to peel following the inevitable moment of fluid removal in the delivery room. 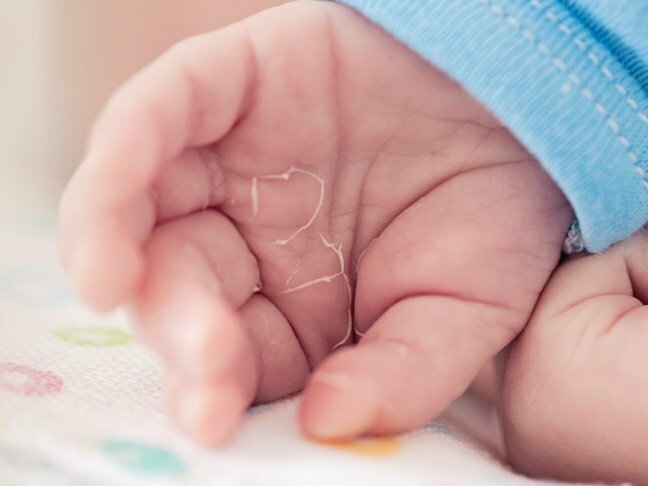 Should you be concerned about newborn dry skin? If you’ve just brought your baby home and discovered peeling that doesn’t irritate your newborn, then it’s normal. If the dryness is accompanied by red patches that don’t fade, then you should consult your pediatrician to rule out skin conditions such as eczema. What can you do to decrease the initial newborn skin peeling? Fight the desire to bathe your newborn every day. Since your baby isn’t sweating, playing in dirt, or smashing food all over themselves yet, he only needs a bath a couple times a week, in lukewarm water. Limiting bath time and frequency will also help retain the natural protective oils in your baby’s skin. Additionally, use a baby wash that’s free to dyes and scents. And, keep your baby well hydrated. How can you soothe newborn dry skin? You can help minimize newborn skin peeling by massaging coconut oil into the affected areas. Not to worry, the situation will resolve on its own within a few weeks after birth. Overall, it is perfectly normal to have your baby experience newborn skin peeling. It doesn’t require treatment from the pediatrician. Simply treat your baby like the delicate newborn he or she is. Should you see red patches or if areas of skin become itchy for the baby, then your pediatrician can offer recommendations.